Dr. Ussama Makdisi is Professor of History and the first holder of the Arab-American Educational Foundation Chair of Arab Studies at Rice University. In 2012-2013, Makdisi was an invited Resident Fellow at the Wissenschaftskolleg zu Berlin (Institute for Advanced Study, Berlin). In April 2009, the Carnegie Corporation named Makdisi a 2009 Carnegie Scholar as part of its effort to promote original scholarship regarding Muslim societies and communities, both in the United States and abroad. Makdisi was awarded the Berlin Prize and spent the Spring 2018 semester as a Fellow at the American Academy of Berlin. Professor Makdisi is the author of Faith Misplaced: the Broken Promise of U.S.-Arab Relations, 1820-2001 (Public Affairs, 2010). His previous books include Artillery of Heaven: American Missionaries and the Failed Conversion of the Middle East (Cornell University Press, 2008), which was the winner of the 2008 Albert Hourani Book Award from the Middle East Studies Association, the 2009 John Hope Franklin Prize of the American Studies Association, and a co-winner of the 2009 British-Kuwait Friendship Society Book Prize given by the British Society for Middle Eastern Studies. Makdisi is also the author of The Culture of Sectarianism: Community, History, and Violence in Nineteenth-Century Ottoman Lebanon (University of California Press, 2000) and co-editor of Memory and Violence in the Middle East and North Africa (Indiana University Press, 2006). He has published widely on Ottoman and Arab history as well as on U.S.-Arab relations and U.S. missionary work in the Middle East. Among his major articles are “Anti-Americanism in the Arab World: An Interpretation of Brief History” which appeared in the Journal of American History and “Ottoman Orientalism” and “Reclaiming the Land of the Bible: Missionaries, Secularism, and Evangelical Modernity” both of which appeared in the American Historical Review. Professor Makdisi has also published in the International Journal of Middle East Studies, Comparative Studies in Society and History, and in the Middle East Report. 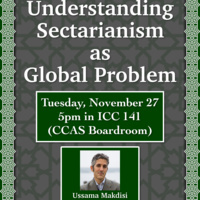 Professor Makdisi is now working on a manuscript on the history of coexistence and anti-sectarianism in the modern Middle East to be published by the University of California Press under the title An Age of Coexistence.